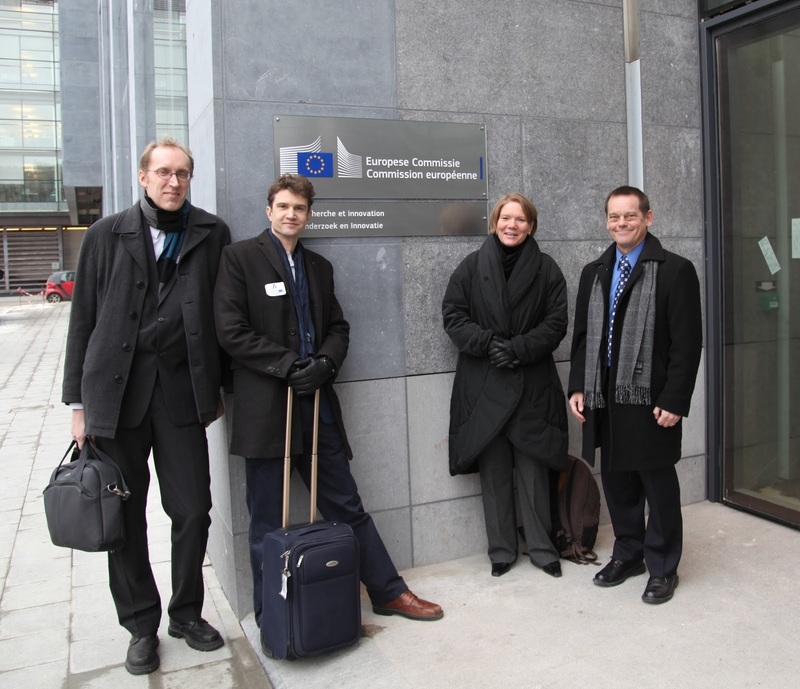 On the morning of 25th January, 2013, a small group from EISCAT Headquarters went on an expedition to the European Commission in a snowy Brussels, Belgium. The group consisted of (from the left in the photo) Anders Tjulin (project assistant), Magnus Friberg (international relations co-ordinator), Ingrid Mann (project manager) and Craig Heinselman (EISCAT director). In the second half of 2012, the European Commission began to review the progress towards implementation of all projects currently on the 2010 ESFRI Roadmap (pdf). The first step of this evaluation was to send out a questionnaire to the different projects. The EISCAT_3D response to this questionnaire is available on-line. In the second step, a group of high-level experts was appointed by the European Commission to determine the financial and managerial maturity of the different projects on the roadmap. Their role is to identify if there are any specific bottlenecks, to make recommendations on how to address these best, and to indicate the feasibility of these projects to be implemented by 2015. The reason for the EISCAT visit to Brussels was to meet these experts, to give a 15-minute presentation of the status of the project and to have 90 minutes of questions from the experts and discussions on topics such as administration, human resources and risk management. The meeting went well in a positive atmosphere. The expert group consists of: Prof. Richard Wade (former Chief Operating Officer, STFC), Dr Antonella Calvia-Götz (expert on Research Infrastructures appraisal at the European Investment Bank), Prof. Milena Žic-Fuchs (University of Zagreb), Prof. Alfonso Franciosi (University of Trieste and CEO Elettra-Sincrotrone Trieste), Prof. Sine Larsen (University of Copenhagen), Dr Karl Tichmann (former Managing Director IPP), Dr John Marks (former Deputy CEO ESF, absent from this meeting). Text: Anders Tjulin, Photo: EISCAT.